Eco-Villa Valencano is a special holiday home with swimming pool in the closer surroundings of the town Bale. The peculiarity is the location on the edge of an olive grove where olive trees breed on expressly ecological way, without the use of pesticides and similar. A non-asphalted road of 2,5 km leads to the house and the power supply is done over solar panels and an own aggregate which is in a separate well soundproofed room. The house has its own water cistern, in this way, the whole property is independent of the electric and water supply. 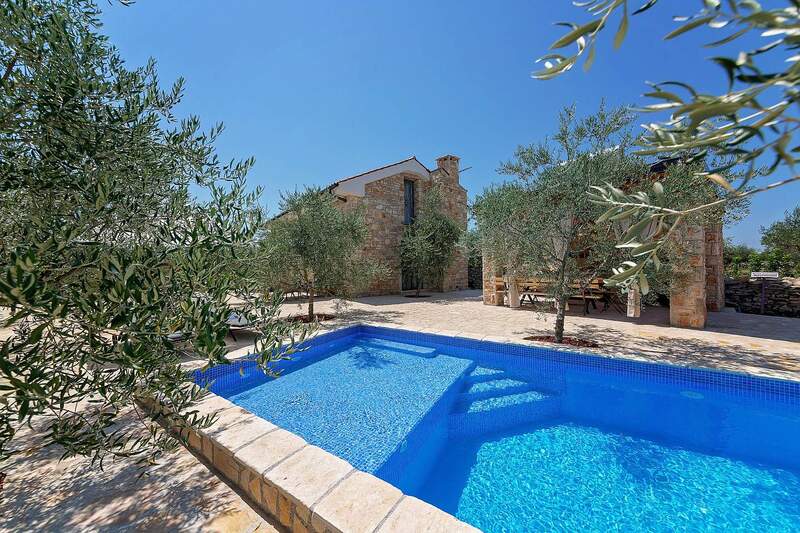 Another special feature is the remote location, there are no neighbours except two dogs that protect the enclosed property with the olive groves, especially in the months when there are no guests in the house. On the large property guests can use the following outdoor facilities: outdoor swimming pool, whirlpool, summer kitchen with covered terrace, table tennis, table football, basketball court, boccia course and others. The accommodation consists of two separate units. In the larger house of 100 sqm on two floors, on the ground floor there is a living area with kitchen, dining table and sofa bed for two people, a single room with private shower/toilet and a separate toilet. On the upper floor there are two air-conditioned double rooms, each with private shower/toilet. The second house of 30 sqm has a bedroom with four beds, a smaller kitchen and a shower/toilet. The extra virgin olive oil from this olive grove is the proud winner of the Golden Award at the fairs in New York and Tokyo in 2018.